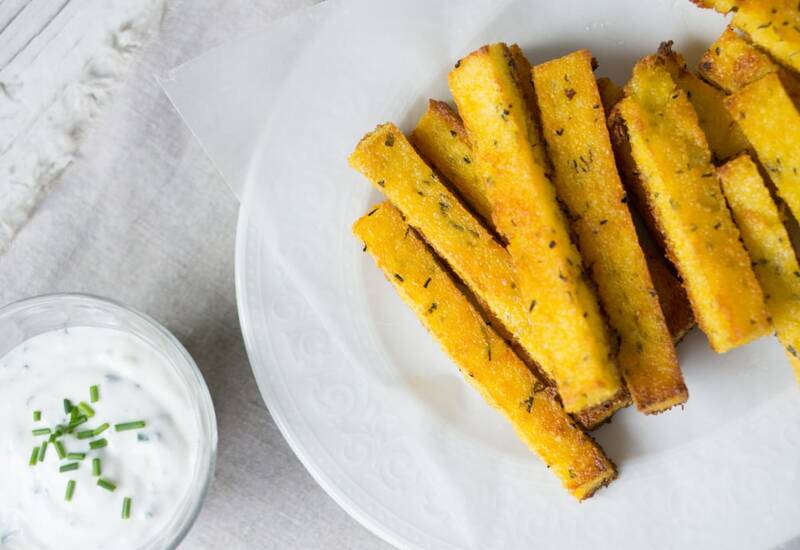 Crispy, cheesy, and bursting with flavor, these polenta fries are a real treat especially served with the yogurt-based dip. Try this recipe for a tasty summertime side dish, appetizer, or snack. This dish also happens to be a great way to use up leftover polenta! Be sure to make the polenta at least four hours ahead of time, so it's able to properly set and chill. Baking the "fries" means less oil and no frying! The savory yogurt dip is a simple mixture of Greek-style yogurt, chives, garlic, and lemon. Spread any extra sauce on pita bread for sandwiches, or serve with cut vegetable crudités! Try mixing chopped fresh garlic and fresh parsley into the polenta before spreading it into the baking dish. Add to the Italian pedigree of these polenta fries by stirring some chopped fresh basil or oregano into the dipping sauce. Alternatively, add a little kick! Mix in 1/2 teaspoon cayenne or your favorite hot sauce, such as Sriracha or Tabasco, to make a spicy yogurt dip. These fries go really well alongside a lamb burger with goat cheese. Per Serving: 135 calories; 7g fat; 11.6g carbohydrates; 7g protein; 19mg cholesterol; 1687mg sodium. It's a shame the yogurt dip isn't listed in the title because YUM! What's not to love about cheesy polenta fries dipped in a tangy yogurt dip? So good. I made this polenta fries and they were so good, I love how crispy they turned out. The yogurt dip is also a must try! The perfect amount of lemon and garlic in the dip. Scrumptious!